We always endeavour to accommodate our patients with their preferred doctor and appointment time however, please understand that this is not always possible. Please notify us if you are unable to attend an appointment. When booking your appointment please notify the staff as to the nature of your appointment as times are allocated according to your specific problem. The doctors consulting endeavour to devote sufficient time to each patient but some patients may take longer than the allotted time, therefore causing others to wait. For as long as each patient is treated on an individual basis this will occur. We thank you in advance for your patience and understanding. Emergency patients can arrive requiring immediate attention. We endeavour to have them seen to quickly, with as little inconvenience to others as possible. If you are referred for specific treatment such as pathology, radiographs, physiotherapy or to another specialist, they will bill you direct. The fees for all consultations are payable on the day. This includes Medicare or Dental accounts and there will always be a GAP difference. Please inform the staff if your account is an insurance claim, vet affairs or other and please have all the details with you. 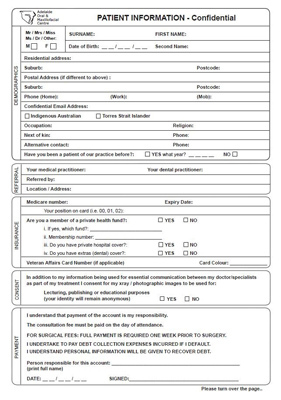 Remember, if your surgery requires the services of an anaesthetist their fee is partly reimbursed through Medicare. If your surgery requires hospitalisation then you or your health fund is responsible for the hospital fee. The exception to this is if the surgery is performed in a country hospital as a public patient, then there is no hospital fee. The supply of medications without consultations is a potentially hazardous practice; therefore in the best interest of your health, it is our policy not to issue prescriptions without seeing the patient. The Medical Board requires that patients should not receive a medical sickness certificate without consultation. Certificates cannot legally be backdated. Patients are reminded that they must make an appointment as advised by their doctor for all test results. Information regarding a patient or their account will only be discussed with the patient 18yrs or over. In the case of a minor only an immediate family member / guardian will receive information. This practice is certified approved by AMADA. Where possible we use disposable equipment. All other instruments are cleaned and sterilised using the current recommended sterilising procedures.